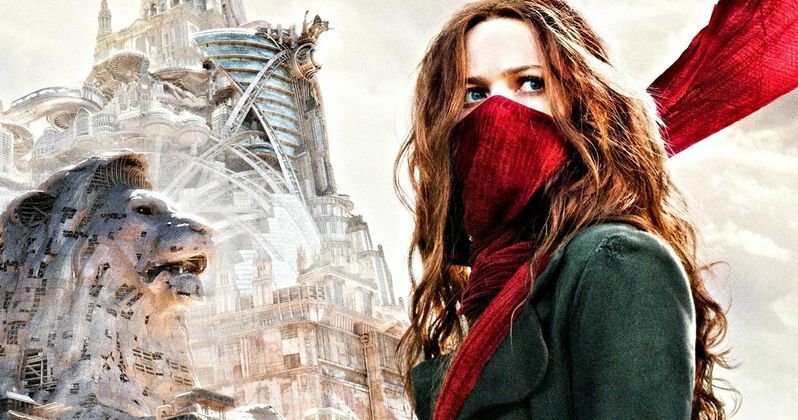 Peter Jackson's Mortal Engines is preparing to release a new trailer this weekend for New York Comic-Con and they have unveiled a new character poster as well as a featurette on Hera Hilmar's Hester Shaw character. The post-apocalyptic adventure film was directed by Christian Rivers from a screenplay written by Fran Walsh, Philippa Boyens, and Peter Jackson. It's based on a novel by Phillip Reeve and is set in a steampunk world where cities have been put on wheels, moving around to prey on one another. Mortal Engines takes place hundreds of years after civilization was destroyed by a cataclysmic event. A mysterious young woman, Hester Shaw, is the only one who can stop London, which is now a giant city on wheels that tries to take down and conquer everything in its path. Hester is feral and is driven by the memory of her mother, who was murdered. She later joins forces with Tom Natsworthy, an outcast from London, along with Anna Fang, who is a dangerous outlaw with a bounty on her head. Mortal Engines opens in theaters in December, and Peter Jackson fans have been curious about the project for years. The first trailer is intense and unrelenting in terms of story as well as the insane special effects that are utilized to bring the book to life on the big screen. Adding to the intensity is the dark and pulsating score from Junkie XL, who leaves a mark on the overall atmosphere. The next trailer will be delivered this Friday, so hopefully we get another look into the specifics of the story. Related: Why the Heck Are Minions in Peter Jackson's Mortal Engines? In other Peter Jackson news, the director is preparing to release his groundbreaking World War I documentary They Shall Not Grow Old. The director and his crew took film that is over a hundred-years old and restored it. Additionally, they have colorized everything, providing a look into WWI that has never been seen before. The documentary tells the story of the everyday lives of the soldiers on the front line, from their perspective. The footage is truly stunning and is laying the groundwork for the future of restoring old film. They Shall Not Grow Old hits U.K. theaters in a few weeks, but does not have a North American release date at this time. Mortal Engines opens in theaters on December 14th. The film has been in development since 2009, and fans of the book have been waiting nearly a decade to see the big screen adaptation. The latest poster shows off more of the steampunk aesthetic, which fits well with the overall look of the film, as seen from the promotional material. While we wait for the new trailer to drop at the end of the week, you can watch the new featurette and check out the new poster below, thanks to the Universal Pictures YouTube channel.